Synopsis: Verily, A New Hope is written in the style of William Shakespeare and is an officially licensed retelling of Star Wars: A New Hope. The story takes place a long time ago in a starcrossed galaxy far, far away. The galaxy has been taken over by an evil Galactic Empire but a small band of resistance fighters, the Rebel Alliance, have won their first great victory against the regime. During the battle, rebel spies were able to steal secret plans to the Empire's Death Star, a space station capable of destroying an entire planet. But after the rebel spy Princess Leia is able to take possession of the plans, her ship is then captured by the lord Darth Vader and his Imperial fleet. In order to prevent the plans from falling back into the hands of the Empire, Leia hides the plans in the data memory of a droid called R2-D2. The droid and its companion droid C-3PO then flee to a desert planet called Tatooine. The droids are then found by a farmboy called Luke Skywalker. After Luke delivers the droids to a Jedi Master called Obi-Wan Kenobi he decides to accompany them on their mission to return the plans to the Rebel Alliance, and to learn the ways of the Force and become a Jedi Master. Made winter by this sudden, fierce attack! Our ship is under siege, I know not how. O hast thou heard? The main reactor fails! We shall most surely be destroy'd by this. I'll warrant madness lies herein! Beep, beep, meep, squeak, beep, beep, beep, whee! LUKE: [aside] This Force, by troth, I'll never comprehend! It doth control and also doth obey? 'Tis both inside and yet outside one's self? What paradox! What fickle-natur'd pow'r! Aye: frailty, thy name - belike - is Force. The thing that most surprised and impressed me about this book was, er, just how Shakespearean it was. You see I was expecting this book to be just the dialogue for Star Wars but written into Shakespearean iambic pentameter but in fact the book has a lot more than that. It's got an omniscient chorus, soliloquies and asides! And because of the book's format it became clear to me just how Shakespearean the story of Star Wars really is. How could I not see that before?! 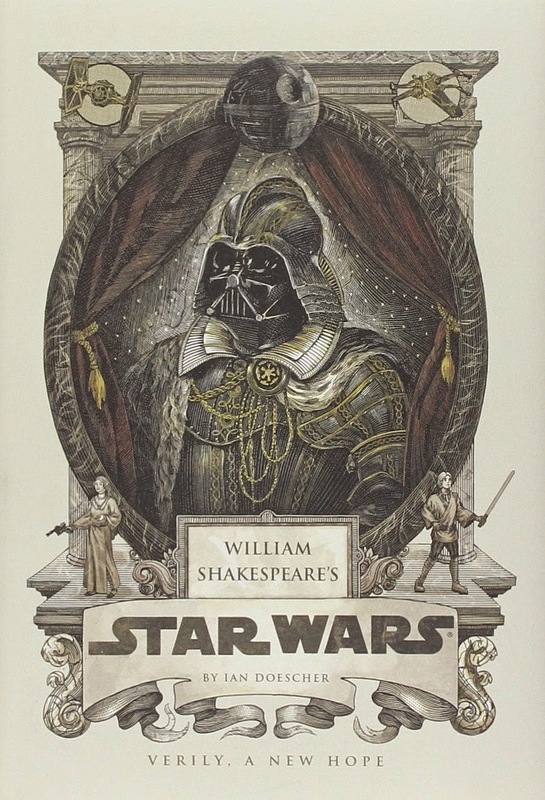 Fate and destiny are hugely important themes in Star Wars; just as they are in many of Shakespeare's plays. The Force has a deeply mystical nature and mysticism is also present in many of Shakespeare's plays. Han Solo and Leia's relationship is very similar to Beatrice and Benedick's from Much Ado About Nothing. Darth Vader has an element of Macbeth about him. The scene where Obi-Wan's ghost communicates with Luke brings to mind Hamlet's scenes with his father. Ian Doescher points out even more of the similarities between the two texts in his afterword. In addition to being a surprisingly enlightening experience, the other major reason to read this book is because it's so funny! Doescher's portrayal of R2-D2 cracked me up! In this book it turns out that R2-D2 can actually communicate in words but chooses to only speak in beeps and whistles as a way of getting everyone to underestimate him. There are illustrations in this book, some of which are very entertaining. I especially liked the picture of Jabba the Hut wearing an Elizabethan collar. There's plenty of meta in this book too. Several of Shakespeare's most famous quotes are hilariously incorporated into the story. Doescher pokes fun at the legendary incompetence of the Stormtroopers, pokes fun at Star Trek, and even makes a hilarious joke out of the "Han or Greedo?" controversy! Obviously this book isn't going to be for everyone and you're going to have to be a fan of both Star Wars and Shakespeare in order to enjoy it, but for those readers who are fans of both I would say that it's an absolute must-read. The only vaguely negative thing that I can say about this book is that some of the Luke and Leia scenes are a bit cringeworthy but then of course that's the source material's fault. Verily, A New Hope is fantastic. I can't wait to read The Empire Striketh Back and The Jedi Doth Return and I really hope that someone will put on a theatrical production of this book some day. Are you reading this, RSC?! Oh I'm so glad you read this and loved it!! I've read the first 2 and asked for the 3rd for Christmas. Yes to all the points you made! I also adore how the opening scrolls are set in sonnet form! They have this at my college library, I guess I just have to check it out now! It sounds terrific! Monica - Yay! I hope you'll enjoy it. You probably will if your sense of humour is anything like mine!